Milo Murphy’s Law is returning soon. Disney Channel just announced the TV show’s second season will debut with Phineas and Ferb crossover in January. 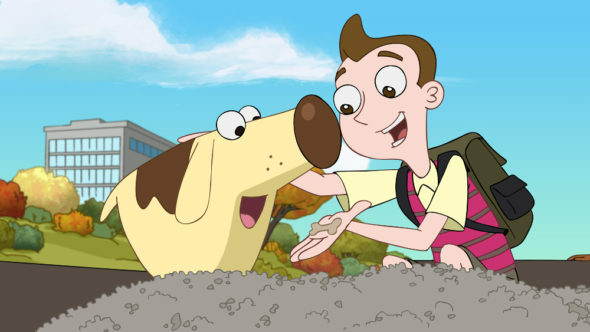 The animated comedy follows 13-year-old Milo Murphy, a descendant of the man whom Murphy’s Law is named after. The voice cast includes “Weird” Al Yankovic, Sabrina Carpenter, Mekai Curtis, Christian Slater, Vanessa Williams, Sarah Chalke, and Jemaine Clement. Sesaon two of Milo Muprhy’s Law premieres on Disney Channel on January 5th at 7 a.m. ET/PT. The series premiere features an hour-long crossover with Phineas and Ferb. News of the season two premiere date was included today in a satirical video podcast (available here) hosted by “Phineas and Ferb” fan-favorite Dr. Doofenshmirtz exclusively interviewing his first celebrity guest, Al Yankovic. “The Phineas and Ferb Effect” follows Milo and his friends, along with their newly discovered neighbors – Phineas, Ferb, Perry the Platypus, Candace, Isabella, Baljeet and Buford – as they work together to overcome Murphy’s Law in order to stop a pistachio invasion. The “Phineas and Ferb” guest voice cast includes Ashley Tisdale (Candace), Alyson Stoner (Isabella), Vincent Martella (Phineas), David Errigo Jr. (Ferb), Dee Bradley Baker (Perry the Platypus), Maulik Pancholy (Baljeet) and Bobby Gaylor (Buford). Starring alongside Yankovic on “Milo Murphy’s Law” is Sabrina Carpenter and MeKai Curtis as Milo’s best friends Melissa Chase and Zack Underwood, respectively. What do you think? Do your kids watch Milo Murphy’s Law? Will they watch the new season? More about: Disney Channel TV shows: canceled or renewed?, Milo Murphy's Law, Milo Murphy's Law: canceled or renewed?